I scream you scream, we all scream for ice cream. When it comes to ice cream age is no bar, we all love it. I have been trying my hand on ice cream making for last few months, but never got satisfactory result till now. The texture, the smoothness, that I was looking for wasn't really there. Lot of research to find the reason took me to a detailed discussion on ice cream making on thekitchn.com and I tried the eggless version. It came out really good. 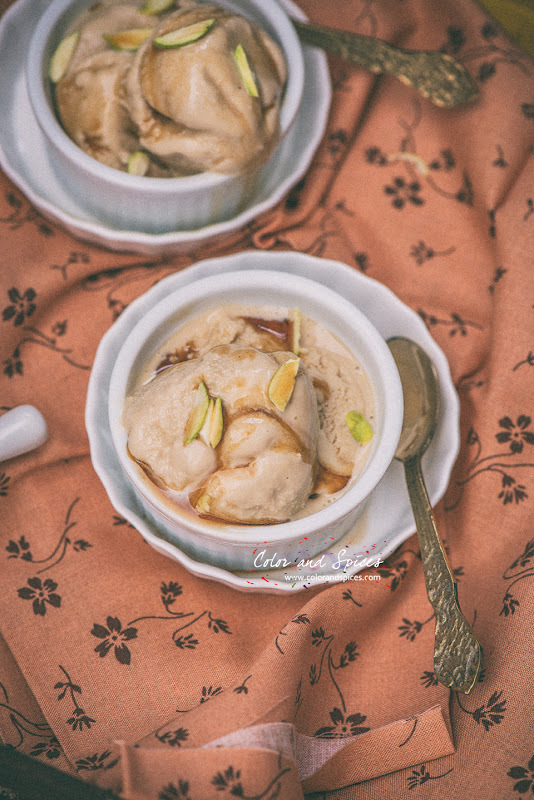 So here it is, my two cents on ice cream making from all the trial and errors that I went through. Making ice cream at home is simple, one need to understand few basic rules of ice cream making. The first thing is to using milk with high fat content. Use full fat milk and cream. Fat makes the ice cream smooth, creamy and rich in taste. Addition of eggs also makes it more rich, but I used corn flour to thicken the milk to make the base for the ice cream. Next is the sweetening agent, the presence of sugar prevents the formation of large ice crystals. We often complain one thing about homemade ice creams that it contains ice crystals and are not as smooth as store bought ones. Incorporating air into the ice cream mixture is the only solution to get the commercial standard of airy ice cream. The best way to achieve that is to using an ice cream maker. But I don't have ice cream maker at home. To achieve that a hand blender works really well. Add the flavor of the ice cream before churning or beating the base. If you are adding alcohol as flavor, add less. Alcohol prevents the process of freezing. If adding nuts or chocolate chips, add it just before freezing the ice cream i.e. at the last stage of churning or beating. Flat rectangular containers are better for freezing ice cream. I used a loaf pan for the purpose. Cover the top of the ice cream with a cling film while freezing, this prevents the formation of ice crystals. 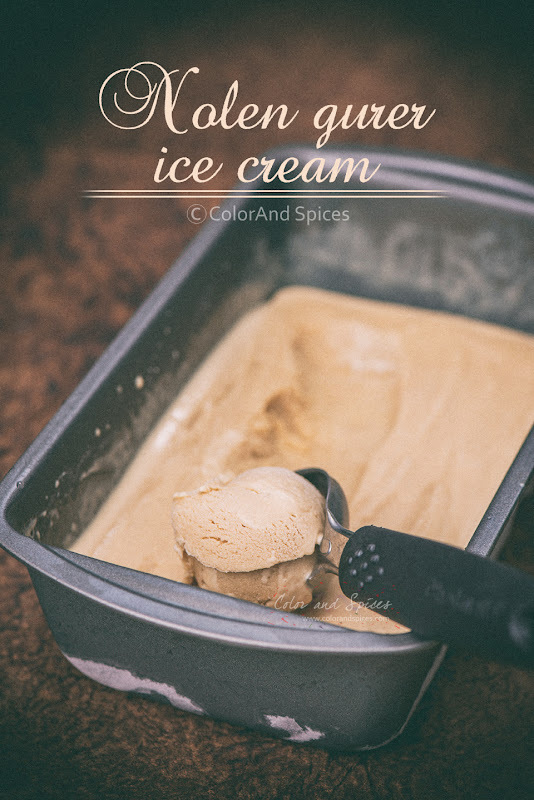 Other than the base and churning part, while making ice cream the flavor plays a vital role. Seasonal fruits is a easy and wise choice or usual flavors like vanilla, chocolate, coffee are there. 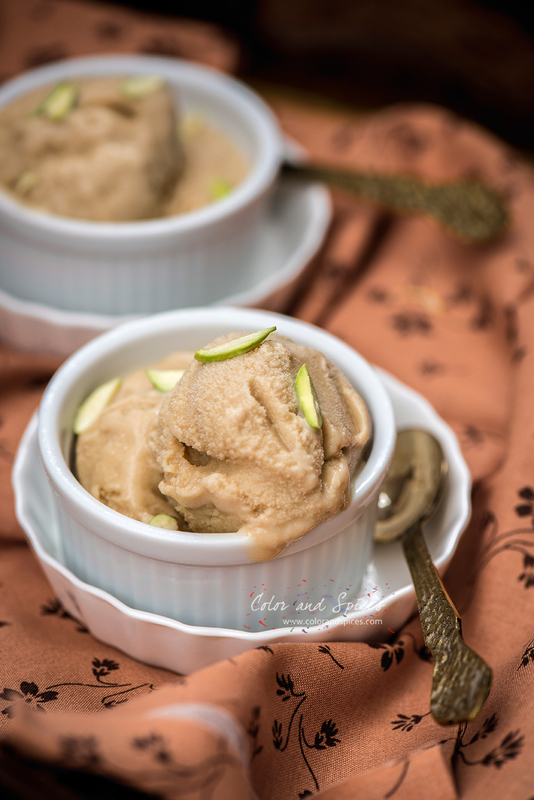 The flavor I used is a very special one, date palm jaggery or 'nolen gur'. 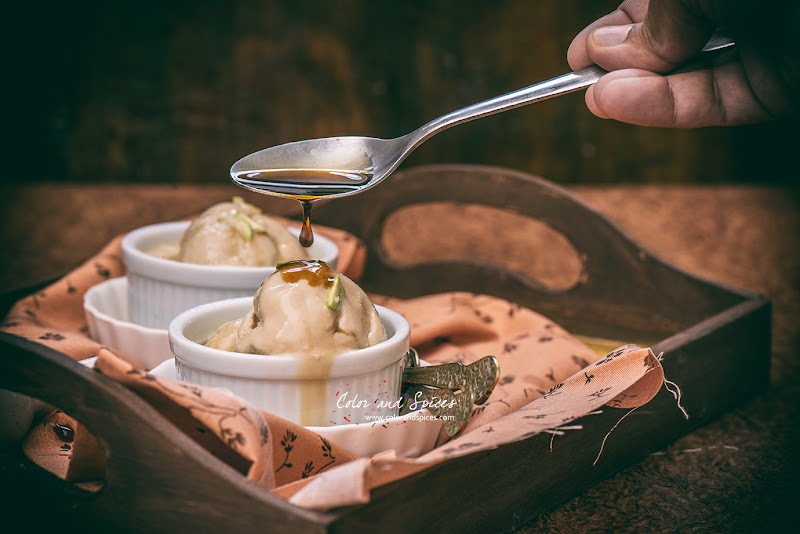 This special variety of jaggery has a unique flavor and taste and is available during the months of winter in Bengal. Traditional sweets are made using this jaggery. These are sold both in liquid and solid form. I always store a big piece of solid nolen gur in my refrigerator to use it in my desserts. This time I used it make the ice cream. 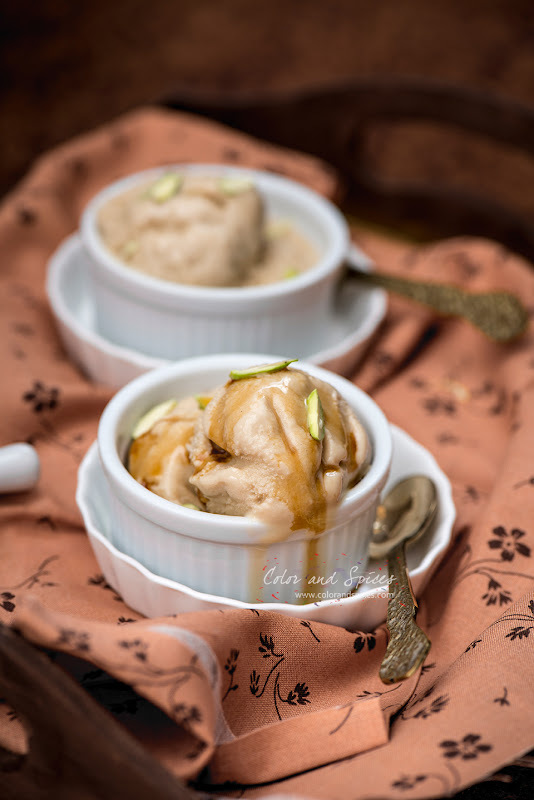 Nolen gur or date palm jaggery acts both as sweetener and flavoring agent for the ice cream. 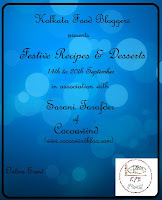 With less than a month to go before the biggest and most awaited festival of Bengal, Durga Puja, I wanted to try my hand at making a sweet dish that is different from the usual fare, something that I can share with my friends and family during the festive days. I combined the traditional flavor of nolen gur with ice cream to make the it extra special. And I was elated it the result. 1. In a heavy bottom pan heat the milk over medium heat till it starts to boil, reduce the heat. Add cream mix well. 2. While the milk is boiling, melt the the date palm jaggery in another pan. 3. Add liquid date palm jaggery to the milk and cream mixture gradually, keep stirring. Taste in between till the desired sweetness is achieved. 4. Add the cornflour dissolved in milk. Mix well. The milk will start to thicken. It should coat the back side of a spoon. switch off the heat. This is the base of the ice cream. 5. Cool down the thickened milk. Keep stirring while it's cooling down. The easiest way is to place the milk in a ice bath and keep stirring. When it cools down completely keep it inside the refrigerator for 30 min. Place the metal beater of the hand blender inside the refrigerator too. 6. Beat the ice cream base for 3-4 min with the hand blender. Pour in a rectangular container, cover and place it inside the freezer. Take it out after 2 hrs, beat it again with the hand blender for 3-4 min. Repeat this process 3 times. Cover the ice cream with a cling film so it does not come in direct contact with air. Then cover the container well and place it in the freezer. Let it freeze for overnight, serve with nuts and more liquid date palm jaggery. Enjoy with friends and family. I used to get them from Bangladeshi stores. Absolutely delightful. I will try this soon. Adding gur in hot milk .....turns the milk to curd formation ....how to avoid that? Reduce the milk or add few teaspoons of sugar to the milk then add jaggery.